Do you know why you have a difficult time trusting people? Do you know where your anger originated? Why do you seem to always feel like you are on the outside looking in? Why do your close relationships seem to crumble time after time? Why ARE you the person you are today? We all have stuff, right? We all have issues and we all have insecurities, whether it is our looks, our intelligence, our need to have people notice us all the time or maybe we shrink back out of the limelight. In our “Chained No More” classes, participants many times will ask these questions but stop short of where these issues originated. Oh, they might blame them on their divorce or someone who betrayed them. 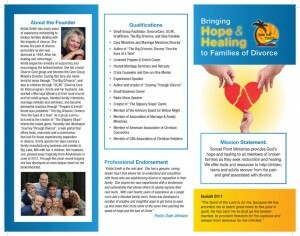 What they don’t realize is that when their parents tried so hard to make people think their family was perfect, yet maybe their home was abusive, alcoholic or very dysfunctional, that could have set our participants up for a life of lies, secrets, perfectionistic issues and feeling less than everyone else. It also sets them up for not knowing how to have a healthy family in their own adulthood. Another issues is if parents split up because of infidelity, the issues begin a life of mistrust, abandonment and betrayal and makes it very challenging to have their own strong and healthy marriage. Many times, our participants come into our classes believing that there is something deeply wrong with them and everything that happened was their fault. Usually, nothing could be further than the truth! Looking back and exploring your childhood can be scary and uncomfortable, but it is the first step to finding healing as you see the power your childhood experiences have had on you. 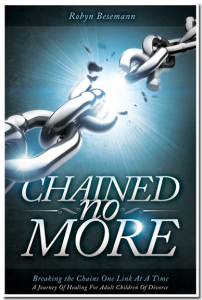 If you are searching for answers for the issues you live with today, please consider purchasing the self-discovery version of “Chained No More…A Journey of Healing for the Adult Children of Divorce/Childhood Brokenness.” Isn’t it time to rise out of the insecurity, anger, fear and depression you feel? You can purchase this version at www.robynbministries.com/store, www.amazon.com or any other bookseller’s retail website.